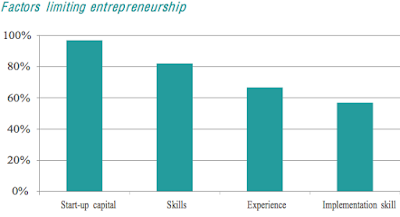 At a time when the Government of India is keen to promote startup enterprises, a spot survey in a Niti Aayog report has found that just about 17 per cent of the urban youth, belonging to the lower strata, are interested self-employment or entrepreneurship, and majority would prefer, instead, permanent, preferably government job. The survey says, while “87 per cent of respondents in semi-urban areas and 68 per cent in rural areas” might go in for self-employment, this is mainly because of fewer opportunities are available in the formal sector. Even in informal sectors, it adds, “employment in private or family occupations are lower”. The survey finds that there is a much higher desire among the females towards self-employment (62 per cent) than male (45 per cent). At the same time, it adds, females were found to be “more likely to opt for higher education (54 per cent), as opposed to their male counterparts (five per cent). “This points towards an interesting information gap that can be bridged to make lower income youth become aware of existing government programmes, policies and schemes to support entrepreneurship, as well as non-governmental funding and patient capital sources available to support business or self-employment, particularly in rural or semi-rural areas”, the report believes.